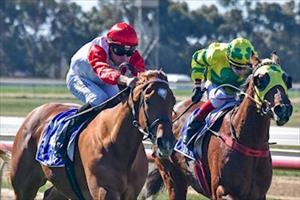 CAN WHAM GO BAM AT BENDIGO? Brutal Power stays at home but we still have three runners at Bendigo on Wednesday. Brutal Power has been scratched from his race, the Maiden Plate (1300m) so that leaves Game Has Changed in race two, the 3YO Maiden Plate over 1600m, last start winner Wham in the Benchmark 64 Handicap over 1600m and Mirimar in the Benchmark 78 Handicap over 2400m. It is the first race start for Game Has Changed, who will be ridden by Patrick Moloney and jumping from barrier nine. The three-year-old son of Lucas Cranach has had practice to home with some solid jumpouts but Mike Moroney is disappointed with the barrier. “We’re really happy with him and the way he’s going, it’s just a pity about the awkward draw,” Moroney said. “He has shown us he has gate speed but I’d say it’s more likely we will go back and try and get some cover. “Ideally we can put him to sleep and give him a chance to run on - I don’t want him to be going forward at his first start. Wham (pictured) runs in race four where he will be ridden by Jordan Childs and has pleased Moroney since his last start win over 1400m at Echuca on August 27. “He’s trained on well and we can’t fault him, he looks magnificent,” Moroney said. “We have a good opinion of him but he’s coming up against what looks like a very smart horse in Merchant Of Venice so we will find out how good we are today I’d say. “It will be interesting for sure and I’d like to think it will be a race in two. Mirimar runs in race six where he will be ridden by Patrick Moloney and jump from barrier five after scratchings. “We’re dropping in weight which is a help but he is up in class,” Moroney said. “His fitness levels are good now, we don’t do too much him at him, more long pace work. “I’m aware he has been up for a little while and this run will tell us if we can press on or he goes to the paddock. Brutal Power had a slightly elevated temperature on Tuesday and Moroney has erred on the side of caution and elected to not to run.